🛑 -> Before continuing please be sure to refer to this article for prerequisites and troubleshooting. 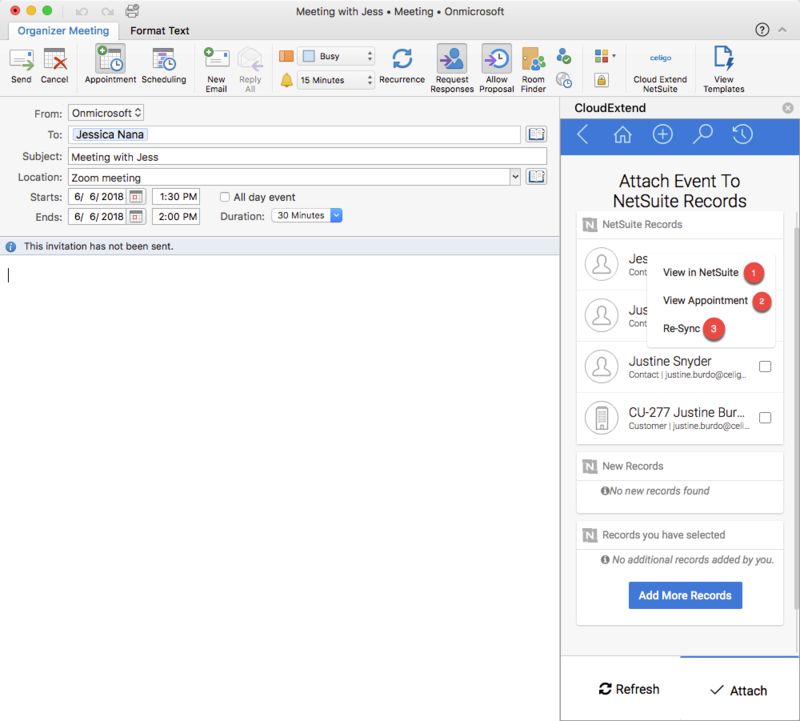 After viewing the above article watch this video and/or follow the article below to learn how to attach Outlook calendar events to NetSuite. Attaching Calendar events works the same way as attaching emails to records. Attaching events is supported for events received or created by the user. If you are trying to attach an event for the first time, you will be asked to select your NetSuite user time zone. Note: It is important that the time zone selected here matches the NetSuite user's time zone. Selecting a wrong timezone may lead to a mismatch in event schedules between Outlook and NetSuite. 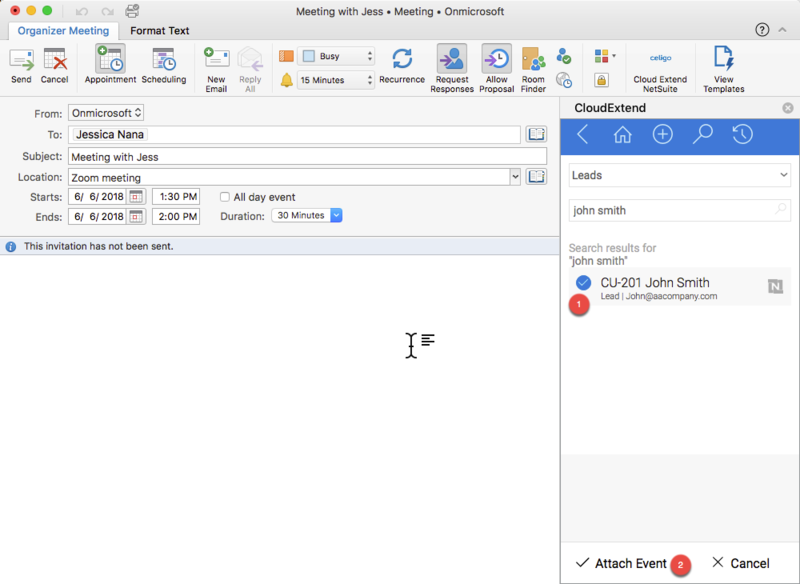 Create a Calendar event in Outlook as you normally would. BEFORE sending your Calendar invite, click on the CloudExtend icon on the calendar view ribbon bar(alternatively re-open the event and click the CloudExtend icon). A quick search is performed to suggest relevant Contact, Customer and Employee records to attach to (or click 'Add more records' to expand the search). 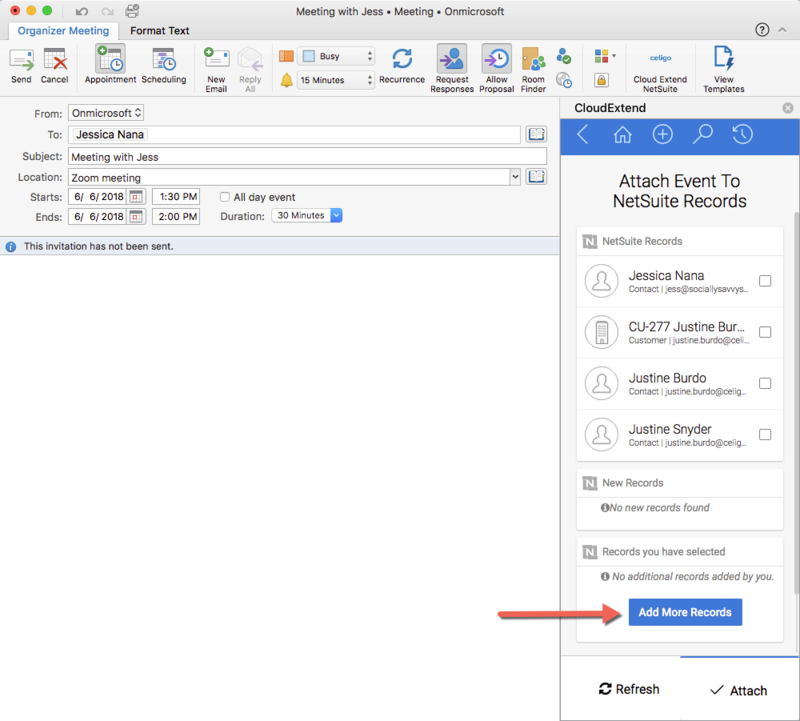 Select the NetSuite record(s) you want to attach the event to and click Attach. After attaching, send your invitation. If you want to add the Calendar event to a supported record type other than the auto suggested Contact, Customer or Employee records click on 'Add More Records'. Choose which record type you want to save the email to. Enter in relevant information and click search. Select the radio button next to the record you want to attach the Calendar event to and hit Attach Event. Remember to send your Calendar event! After the event has been saved, you will notice 3 dots next to the record(s) it is attach to. View in NetSuite - this will bring you directly to the record in NetSuite. View Appointment - this will bring you to the Calendar Event in NetSuite. Re-Sync - if an event is changed after you already saved it to NetSuite the updated event will not reflect in NetSuite until it is re-synced by clicking 'Re-Sync'. If you have 'required' custom fields on your event form NetSuite will return an error message and the event will not be saved. Refer to this article for more information. 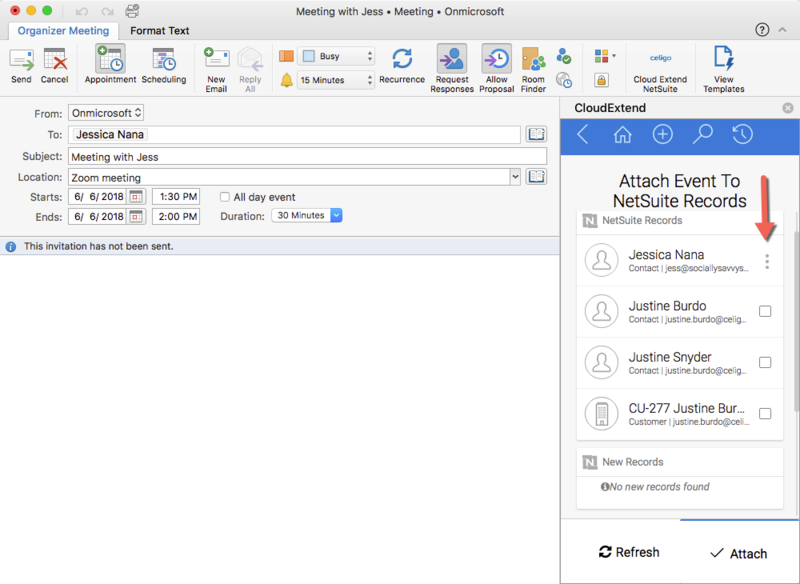 If any of the attendees from Outlook event are not entities in NetSuite, those attendees will be skipped and will not appear as attendees in the event created in NetSuite. If the event previously attached has changed, these changes will not sync automatically and you would be required to manually re-sync the changes. If you are trying to attach an event to a contact that is not invited to the calendar event the contact must be related to a company. Post attaching the event appears as an activity on that contact and the associated company as well. All Events are saved under the Communication tab under Activities in NetSuite. See this article for prerequisites and additional troubleshootingg advice.